Domestic rabbits should NEVER be released outdoors! 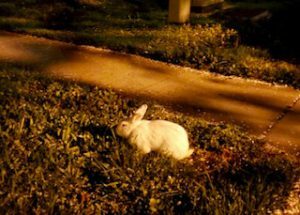 There are many dangers for a rabbit that has been abandoned outdoors or has gotten loose from a backyard. Rabbits are not like wild hares. Domestic rabbits don’t know how to care for themselves outdoors. If there is a food source they may survive for a short amount of time, but they will ultimately succumb to starvation or worse killed by a predator. Birds of prey, raccoons, dogs, cats, coyotes, bob cats, mountain lions will all kill a rabbit. We’ve had several people tell us of mountain lions coming into their back yard in El Dorado Hills, CA. One woman had her rabbit in an exercise pen on her patio and went inside for a minute. When she returned her rabbit had been killed by a mountain lion. Bob cats have been seen roaming the backyards of Folsom, CA. 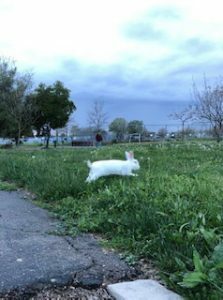 Rabbits are not safe outdoors. It’s not worth the risk to leave a rabbit outside alone. If you can’t keep your rabbit NEVER release him/her outdoors. Instead take the rabbit to a local shelter. Taking a rabbit to a shelter doesn’t mean a death sentence. Many shelters have excellent volunteers who work directly with the rabbits and help to get them adopted. Shelters also work closely with Rabbit Rescue organizations. 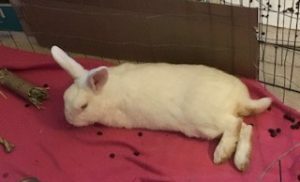 We encourage rabbits to be kept as indoor house rabbits. They will live longer and are happier and healthier. They are part of the family and will form strong bonds with their family. Glacier was sadly abandoned in a park in December. Finally safe! Glacier is relieved to have been rescued. He is receiving lots of food, water and TLC in foster care. He can finally rest knowing he is safe.